Get this tool to rip DVD movie to iPad, import and play DVD on iPad for iOS 4.0 or above! iPhone OS is a mobile operating system developed and marketed by Apple. It is the default operating system of iPhone, iPod Touch, and the iPad, iPad 2. It is derived from Mac OS X, with which it shares the Darwin foundation, and is therefore a Unix-like operating system by nature. Apple previewed iPhone OS 4.0 on April 8, 2010. It will be available to the public on June 7 during the Apple Worldwide Developers Conference for iPhone 3GS, iPod and iPod Touch (3rd Generation), and this fall for iPad. Apple's iPad 2 tablet follows on from the company's iPad and bridges the gap between the iPod touch and iPhone models and its MacBook range of laptops. "One million iPads in 28 days - that's less than half of the 74 days it took to achieve this milestone with iPhone," said Steve Jobs, Apple's CEO, in a statement released Monday. "Demand continues to exceed supply and we're working hard to get this magical product into the hands of more customers." There are also more than 5,000 new applications created specifically for the iPad, in addition to more than 200,000 applications on the App Store written for the iPhone and iPod touch. Meanwhile, Digiarty Software also pays enough attention upon iPad related software. And this time, it focuses on Ripping and converting DVD movies onto iPad with iPhone OS 4.0 (coming soon) on Mac. It still has few months to get ready for updating iPad to iPhone OS 4.0, but as for WinX DVD Ripper for Mac, popular solutioin to convert DVD to iPad, it is just being on a time-limited promotion. And WinX DVD Ripper Platinum is the corresponding software with same function, but just for Windows users. After Free Download DVD Ripper for Mac, then it is easy to get familiar with this Mac-OS-Only DVD to iPad ripper. It is capable of running upon Mac OS X Mavericks/Yosemite/El Capitan and also macOS Sierra. And people can easily make perfect 1:1 DVD copy to hard drive and backup your DVD movies on Mac OS to iTunes, MOV, MP4, FLV, etc., that are playable on iPad, iPod, iPhone, Apple-TV, PSP and much more. 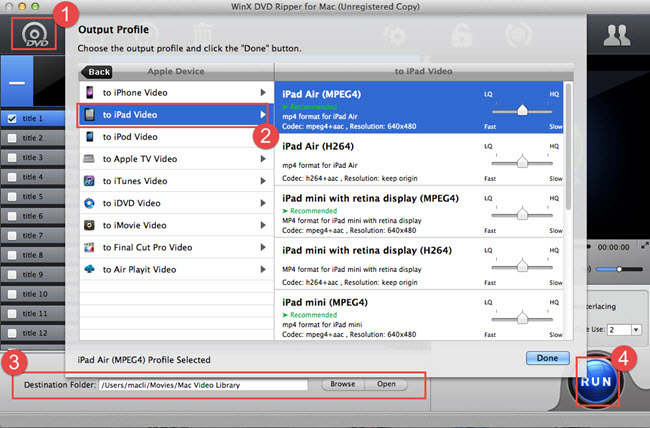 Here is the step-by-step tutorial for the Mac fans who are preparing to convert DVD to their iPads, and in the near future, transfer DVD to iPad with iPhone OS 4.0 or later. Windows user try Free WinX DVD Ripper. Step 1: Load your DVD by clicking Disc or Path button. 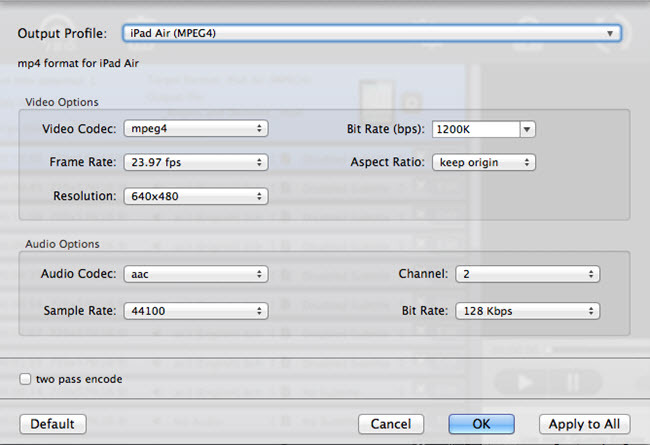 Step 2: Right select to iPad table to as the output video format. And to Rip DVD to iPad for Mac option available soon. Optional: Check the Profile Setting button, a variety of iPad profile parameter settings are available for all kinds of iPad users. Step 3: Select output folder for the converted files. Step 4: With RUN button to begin the DVD to iPad with iPhone OS 4.0 or above converting process. * Convert DVD to Video and Audio on Mac. * Continuously Update to Support the Latest Copy Protections. * Advanced Flexible Functions for DVD Conversion. * Make 1:1 DVD Copy, Backup DVD to iTunes for Mac. * Convert DVD to iLife with Ease on Mac. * Extract Audio and Picture from the Videos and stored in iTunes. After the DVD ripping process, you need to load the video into iPhone or iPad with iTunes. If you hate transfer video to iPhone/iPad using iTunes, WinX MediaTrans is a better way to go, with which any SD, HD and even 4K movie or music video can be added to the iOS (10) based devices in the shortest time. Convert AVI to iPad - Convert AVI video to iPad supported format for playback. Apple iPad / iPad 2 - With 9.7 inch touch screen, it does things no tablet PC, netbook, or e-reader could.